When I am on a job, it is always fun to see bystander’s reactions. 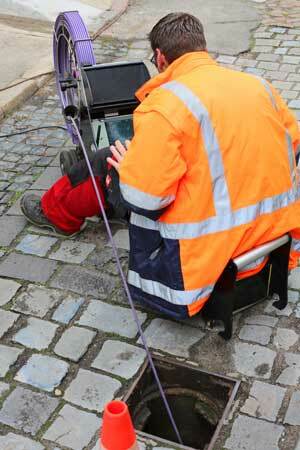 Most people have never heard of a sewer camera. They have been around since the early 1980’s. The technology is awesome! 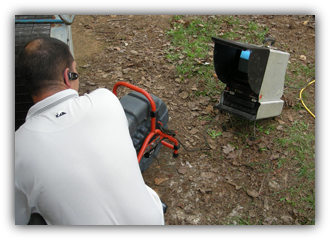 You get to find out what is going on with a plumbing pipe and you get to record it on a VCR tape or a DVD. Most cameras’ have a transmitter inside that allows you to locate the pipe or pinpoint the problem/missing item(s). Many construction companies use this tool when they want to tie into existing sewer pipes, inspect the inside of septic tanks, manholes, and catch basins. Real Estate Agents, home buyers, home sellers, real estate inspectors, and landlords can find out what their tenants are putting down their drain (i.e. tampons, wipes, diapers, and plastic bags.) Plumber’s can do multiple excavation’s in one day armed with this tool. You the home owner can often gauge how much time you have to budget and plan for a repair. But the most important reason to get a video inspection is to avoid being sold a $5000 dollar dig up by our competitors salesmen. You probably will not be able to recoup the cost of digging if you sell your home.Unless you really like a property your not going to pay $5000 over market value for it .Why would someone else.